From Ancient Greek ruins to sandy beaches, from Ottoman castles to fantastic food, from Byzantine frescoes to high wind kitesurfing – the Peloponnese is a place to escape to and never want to come back. We spent a week and could easily go back for a month. In one week we covered only two regions of the Peloponnese as you can see from the map below, and then followed this with two days in Athens. It’s an easy place to rent a car and drive yourself around although central Athens is not for the faint of heart. First base of operation was Nafplia. This gorgeous small town has a deep and eclectic history. 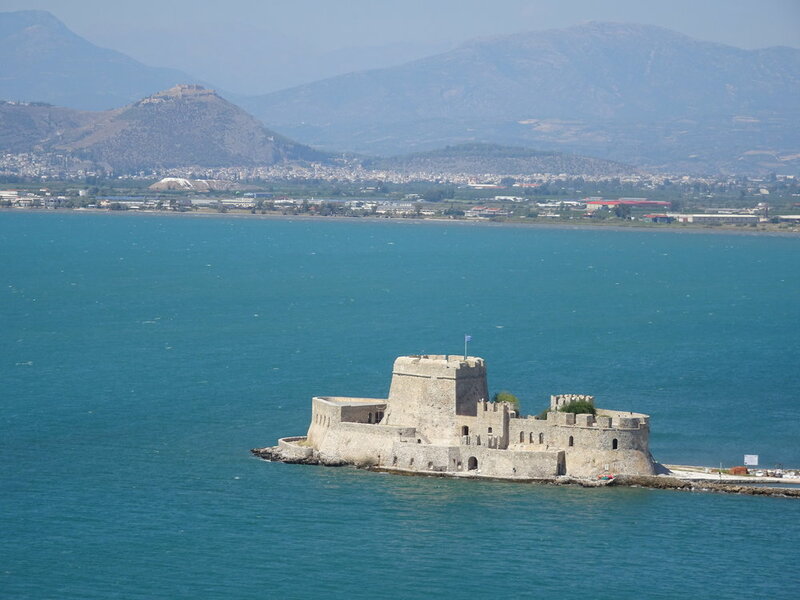 Set within 30 minutes of Homer’s cities of Mycenae, Argos and Tyrens it nestles on a beautiful bay bathed in sunshine. The ancient Greek ruins can no longer be seen in the town but you can find Roman, Crusader, Venetian, Ottoman and, of course, more modern Greek history all within a 10 minute walk. 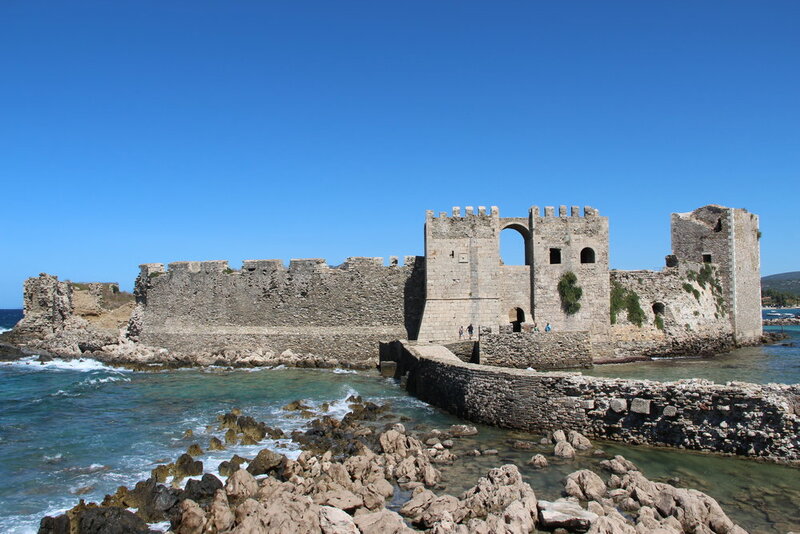 The town is dominated by the Palamidi, an enormous castle complex built by the Venetians, then taken by the Ottomans, and below it a Crusader castle which is now a 5 star hotel. 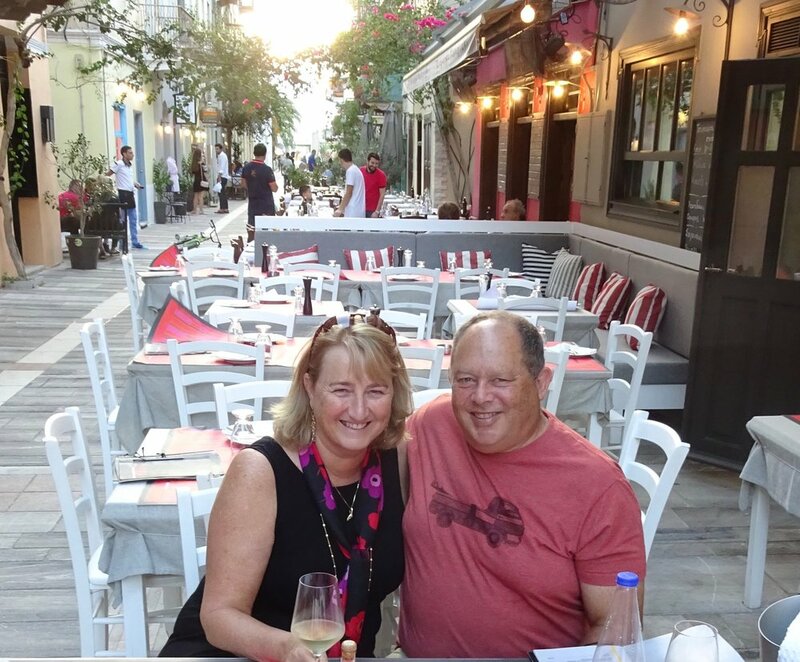 Nafplia was made the first capital of the newly liberated Greece for 5 years in 1829 and retains the charm of that time with a central square surrounded by 19th century buildings which positively erupts into laughter, wine and children in the evening. 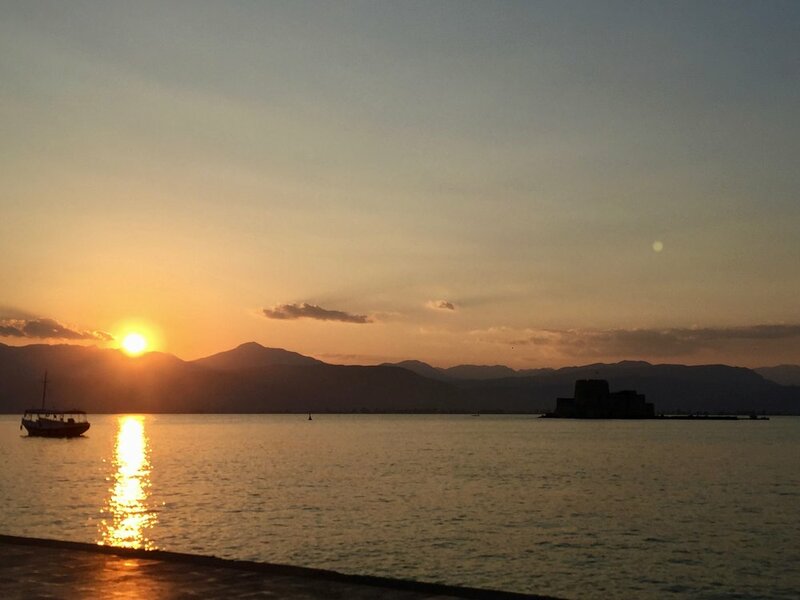 You can spend a perfect evening watching the sun go down over the small Venetian castle in the center of the bay, and then wandering over to the square or one of the waterfront restaurants for dinner. 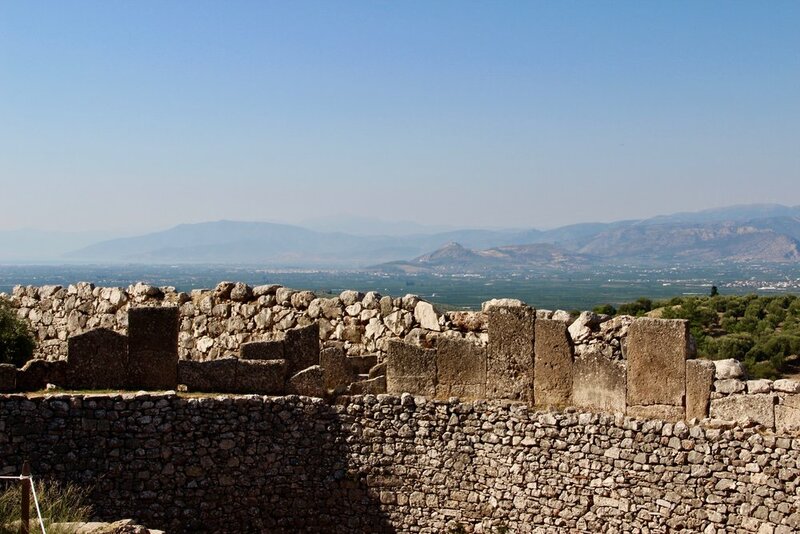 We explored Mycenae – nothing like 3500 year old buildings and tombs from classical Homer – and the abandoned castle of Larissa above ancient Argos. We drove to Epidaurus to remember the many classical Greek plays which premiered there, and explored the peaceful archeological site of Nemea set by the “wine road”. Each site was visually stunning, well maintained, easy to explore and so very old. Next stop Mystras, the site of an abandoned Byzantine city. On the map Mystras is right beside ancient Sparta so we decided to follow Google maps directions, thinking we’d walk in the footsteps of Leonidas. No such luck. The road disappeared into a track, which disappeared into a grassy knoll covered in trees and no evidence that Sparta was ever there at all. Mystras, however, is not to be missed. Built in the 13th century and abandoned by the 18th century, it contains more than 9 churches whose interiors are covered in frescoes and the (still working) Peribletos monastery which has very rare 14th century Byzantine frescoes in it. It’s hot even in September but as we walked through the monastery, surrounded by the smell of the flowers in the courtyard and the softly humming bees I could imagine giving up the hustle of modern life and retreating there for a life of contemplation. Frescoes on every surface - Jerusalem perhaps? But Mystras is inland and we were also chasing the wind. On to Costa Navarino on the West coast of the Peloponnese. The draw was a world class kitesurfing beach which is a stones throw from the ancient Homeric site of the Palace of Nestor. The Palace ruins are small but gave us a sense of how opulent Mycenean culture was, and they certainly knew how to pick a site from which you could see the whole coast, and so see your enemies coming. And enemies came and took this coast from then on. There are two excellent castles to visit – at Pilos and Methoni. Originally Venetian, and then Ottoman, they are on the coastline surrounded by blue water and pounding waves. Pilos, on the Bay of Navarino, holds a special place in European history. It’s here that the English, French and Russian navies unintentionally trapped the Ottoman fleet and destroyed it in 1827 marking a critical milestone to Greek independence. Not only is the castle great fun to explore, it also has an AV recreation of the naval battle which, if you love naval history as we do, is an exciting way to re-experience the battle. One of the other wonderful aspects of the Peloponnese is the beach life. Costa Navarino is a hotel complex with a long, glorious beach where the wind blows almost every day across beach bars, restaurants and every other beach resort entertainment you would expect. So for us we were both happy – history in the morning, kitesurfing (or a good book) in the afternoon. It’s a straight shot back to Corinth from Costa Navarino. 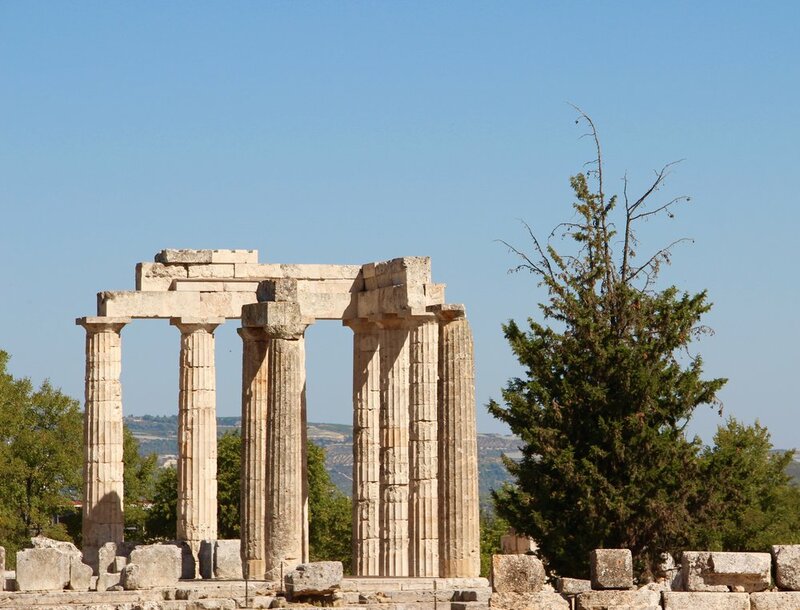 Ancient Corinth developed in the 8th century BC and has mostly Roman ruins to explore. But above the city is the enormous, astonishing acropolis of Acrocorinth. This sprawling castle on a huge rock mountain above the town was continuously occupied from ancient Mycenean times to the 19th century. Built, and modified, and rebuilt over and over on the ever increasing foundations. Greek, Roman, Byzantine, Frankish (crusader), Ottoman… Julius Caesar walked through the gates and it was sold to the Knights of St John for 4 years in the early 15th century. We only allowed a couple of hours to explore which was not enough. The Corinth Canal is not to be missed, and do not visit it from the recommended visitors area. Find your way to the central part where there is a small footbridge (over a refinery pipe) and you can stand in the middle and see the 2 miles on each side of you. The road ends before the footbridge but there is a dirt track to get you to the edge of the canal. It’s deep, dark, with yellow walls and black water. I wonder if world trade would have been different if Nero had lived and completed his vision for the project in the 1st century AD? And finally, Athens. If you brave the traffic don’t miss the archeological museum. Or the Acropolis. The Mycenean treasures from Mycenae and the 5th century BC gold jewelry are so delicate, the designs so gently pulled from the gold, you cannot but wonder at the incredible artistry of the ancients. Our travel was arranged by the travel concierge service Indagare.com. We stayed at the Nafplia Palace Hotel in Nafplia, and the Romanos resort in Costa Navarino. Both were marvelous.